Explore the changing colors of fall with a light table! Before school began this year, I finally decided it was time to invest in a new light table. I wanted a table that could stand alone, be large enough for several children to work on at one time, and have good lighting that worked well even during the day time in a classroom with lots of windows…. Heavy cardboard (I cut up a white corrugated cardboard science board into small squares that I found at the Dollar Tree. One board makes about 20+ frames and the cardboard also makes great paint or glue canvases for art). Overhead projector film or some other type of heavy clear plastic that you can cut. Fall is such an amazing time of year to explore nature through many different ways in the classroom. Light table exploration is just one example of the things we are and will be doing over the next few weeks. I am so glad that we have preschool in the fall. It is such an amazing time of the year! Your link for the light table only got me to the main amazon page. Can you give more information on this table. Your table has a shelf and the one I saw that was similar did not. Hmmm, I hadn’t noticed but yes, my table has a shelf below. Great idea! I wonder, that since I’m lousy about cutting nice even squares inside card board, if one could use the pre-cut mat boards from picture frames instead? I think those can be found at the dollar store too. Thanks for all the inspirations you give us! 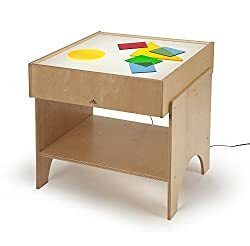 Where did you get your light table? I am on a limited budget and looking for suggestions. I purchased it off of Amazon when I found it go on sale. There is a link to the light table in the post.